A new survey from Dogs Trust and Cats Protection has revealed that two thirds of pets are worried by fireworks and that 93% of their owners alter their routine during fireworks celebrations to try to minimise the trauma on their pets. The survey of 3,750 pet owners shows that two-thirds of dogs and more than half of cats display signs of fear and as a result, nearly a fifth of owners have consulted a veterinary surgeon or animal behaviourist to help their pet deal with their fireworks fear. 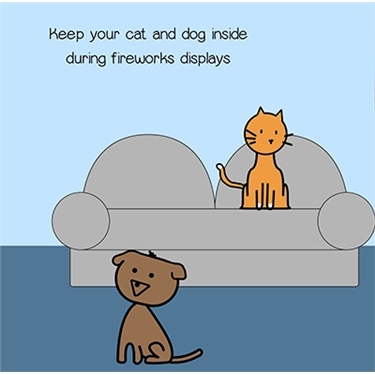 An infographic created by the two charities explains how to keep your cat or dog calm and safe during fireworks celebrations – download here.